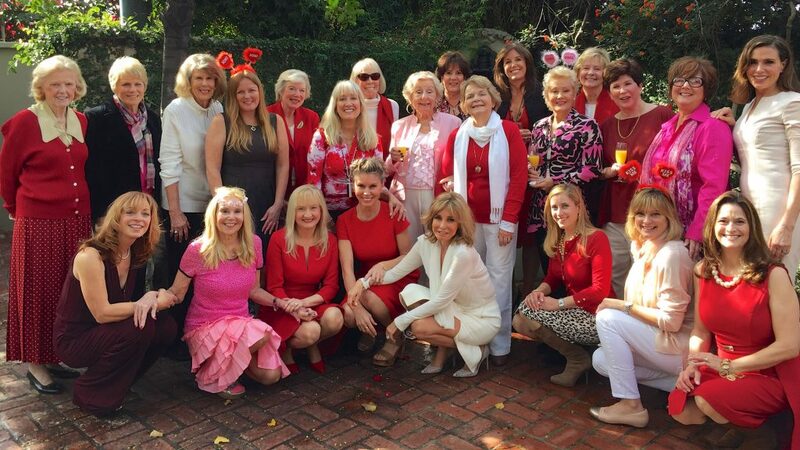 Current Garden Club members dressed in honor of Valentine’s Day at their February 2017 meeting. 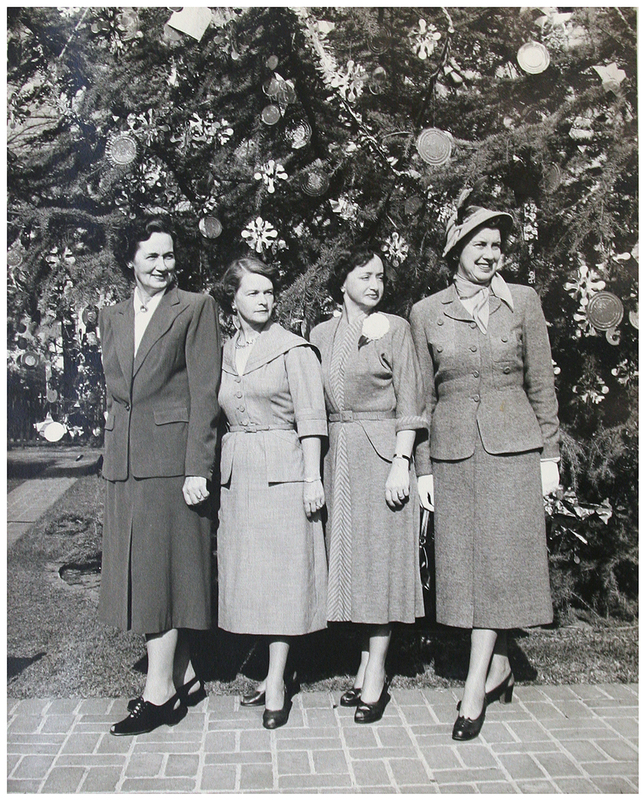 Photo courtesy of Toluca Lake Garden Club. 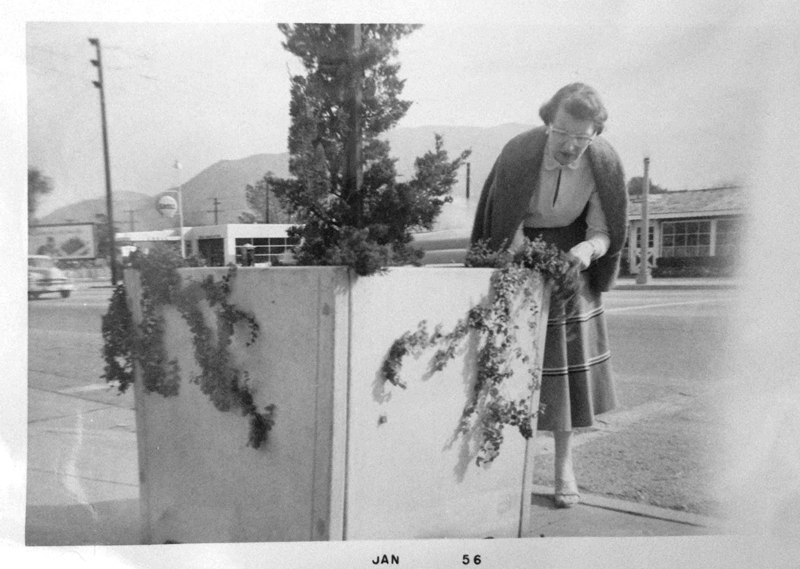 In its early days, the Garden Club raised funds to create and care for hanging flower baskets decorating the lampposts along Riverside Drive. 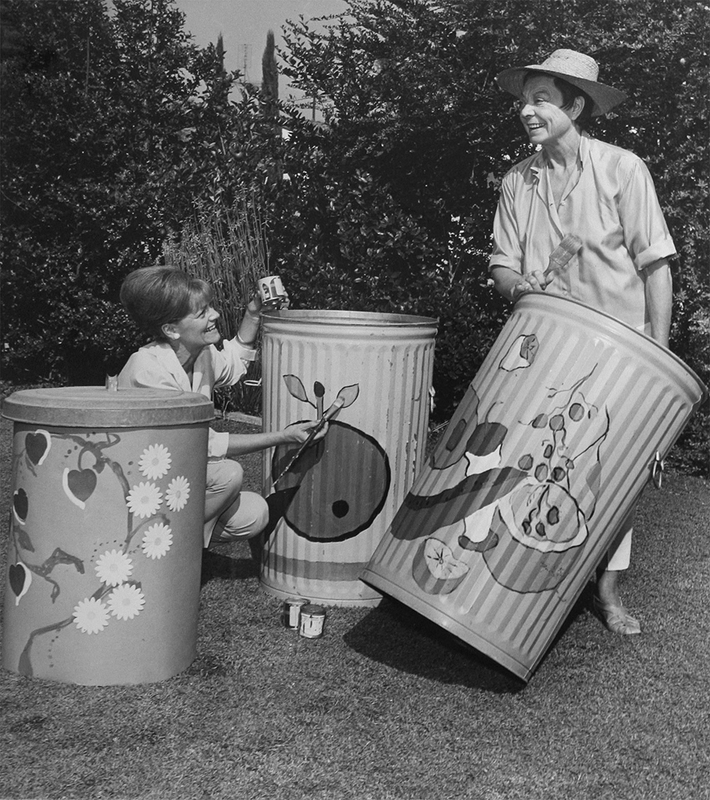 Members Reah Thompson and Leosia Shirley displayed an example basket for the front page of the L.A. Times “Women” section in May 1951. 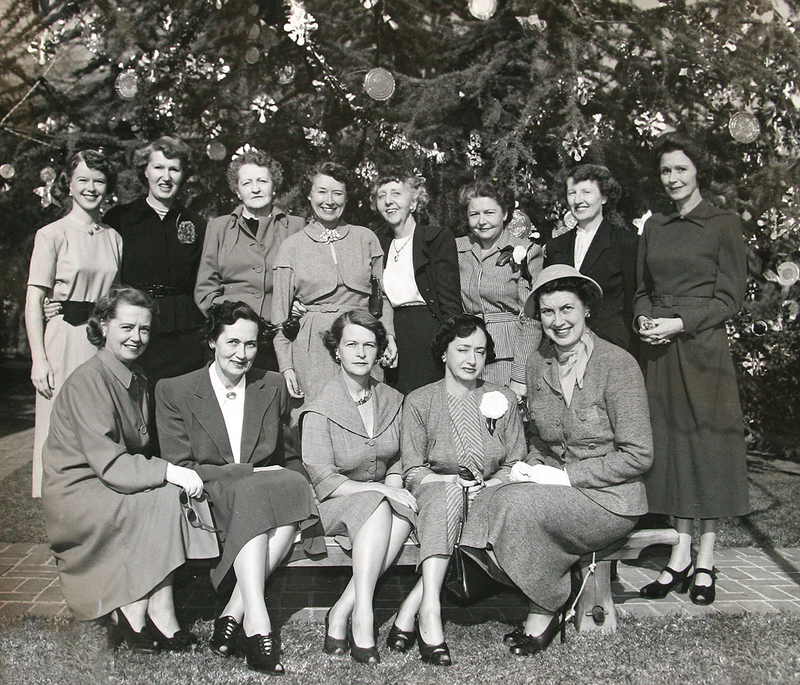 Photo courtesy of Los Angeles Times Photographic Archive, Library Special Collections, Charles E. Young Research Library, UCLA. 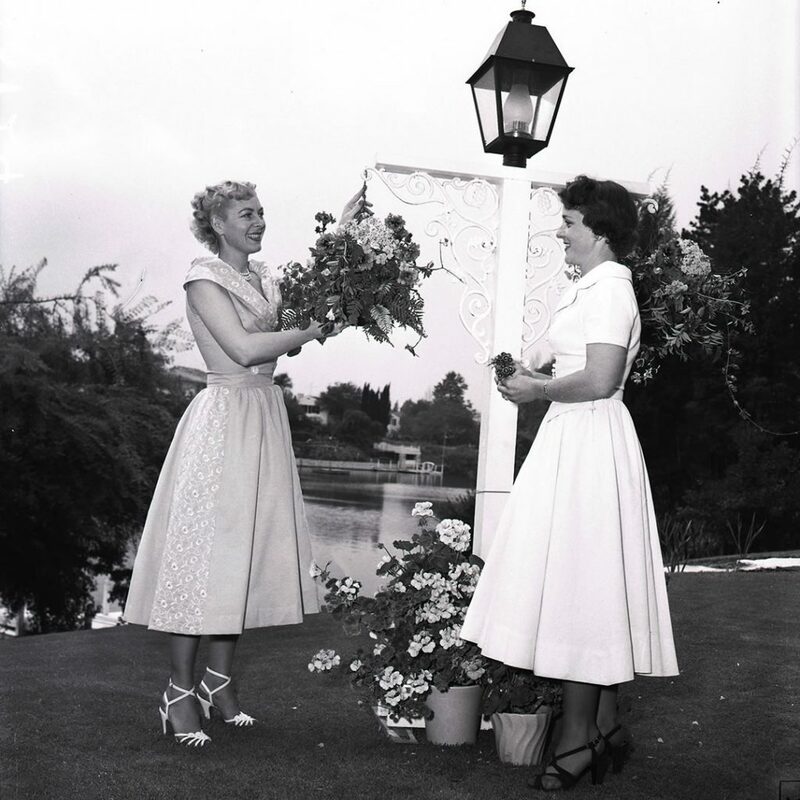 In 1947, a few of those fortunate green-thumbed residents joined together to sustain and promote the neighborhood’s signature landscapes. 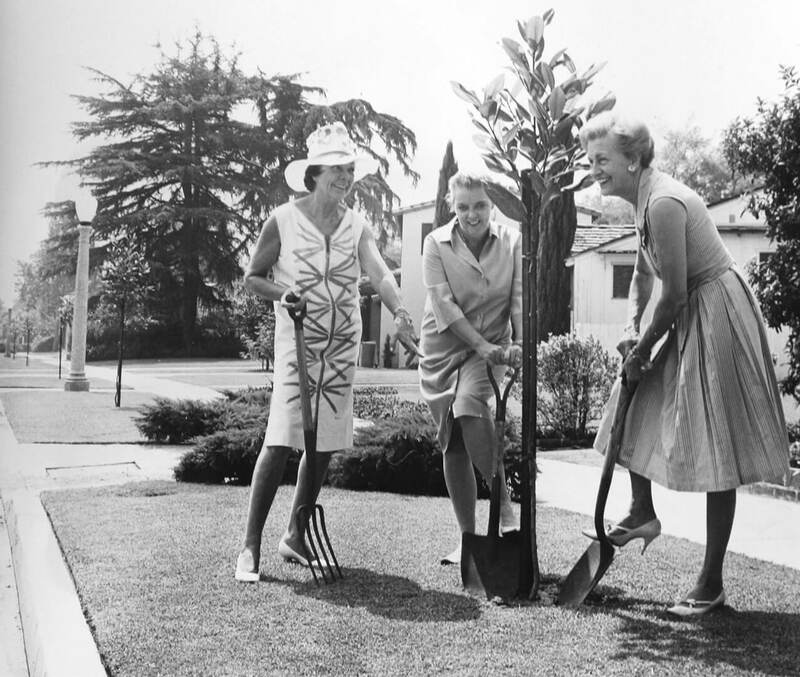 Dorothy Hamilton started the Toluca Lake Garden Club — along with founding members Jean Babcock, Lillian Brummel, Betty Krause, Alma Stewart and Mae Vargo — as a way to nurture community goodwill as well as greenery. 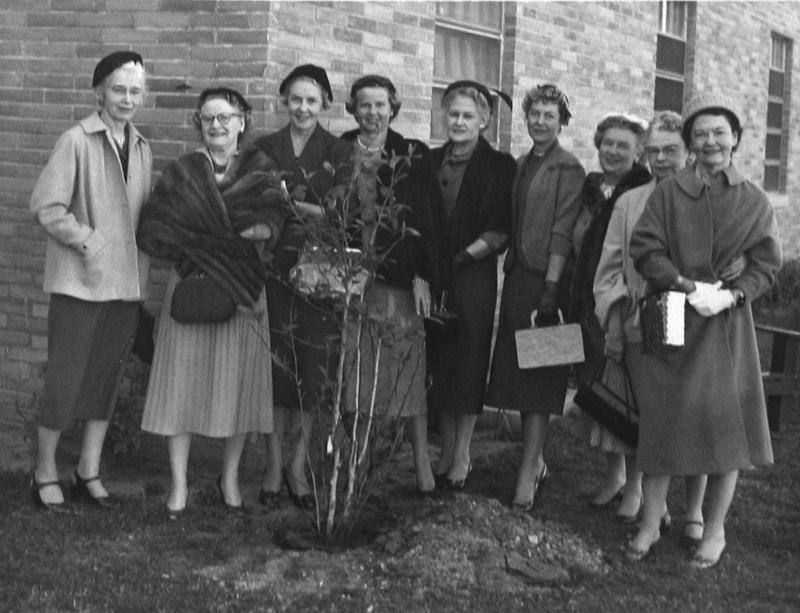 Clad in dresses, high heels and pearls, the ladies of the Garden Club worked to enhance the image of Riverside Drive through projects such as planting flowers and painting the trash cans, and the city applauded their contributions. As the club celebrates its 70th year, “trying to find new ways to beautify our neighborhood today seems to get harder to do, with all the city’s red tape and limitations,” says Robyn Allyn, the club’s president for the past three years. 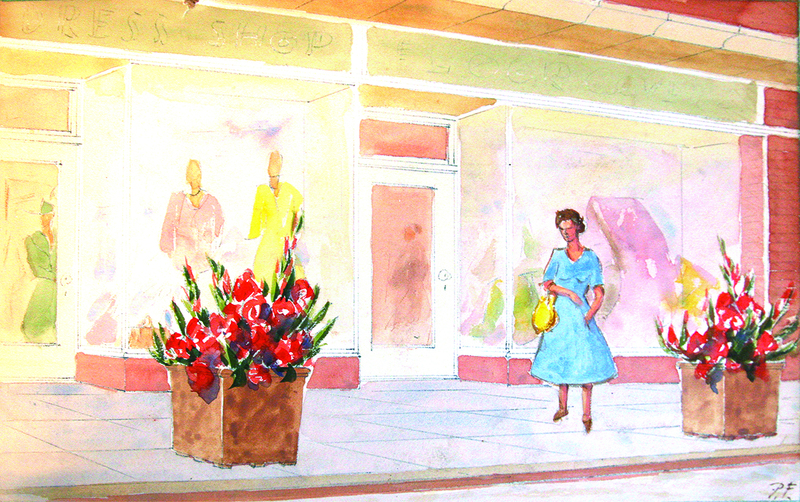 “But this doesn’t stop us from trying to accomplish what we set out to do.” Although some things (including gardening attire) may have changed, the club’s core values have endured and blossomed through its members’ strong connections, preservation of tradition and dedication to making Toluca Lake a lovely place to be. 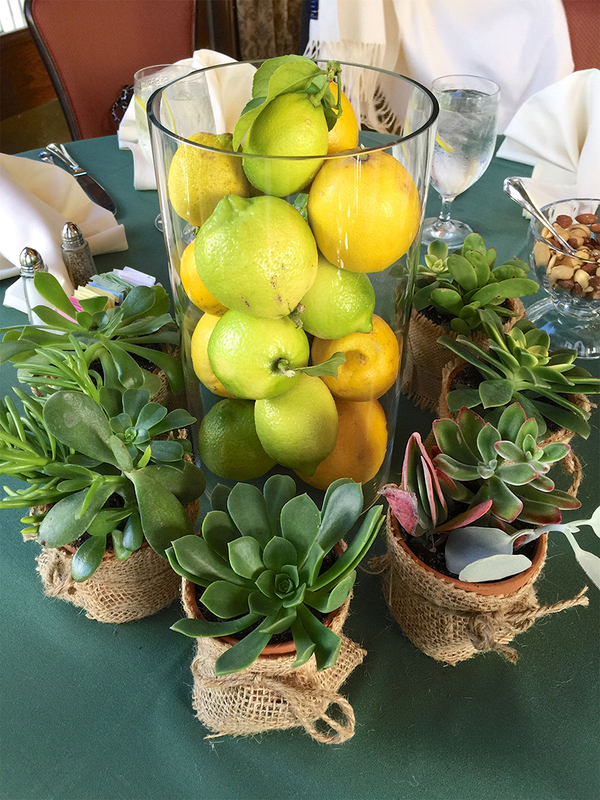 Botanical centerpieces adorn the tables at club meetings, such as this one created by Joey Chuy of Forget Me Not Florist. 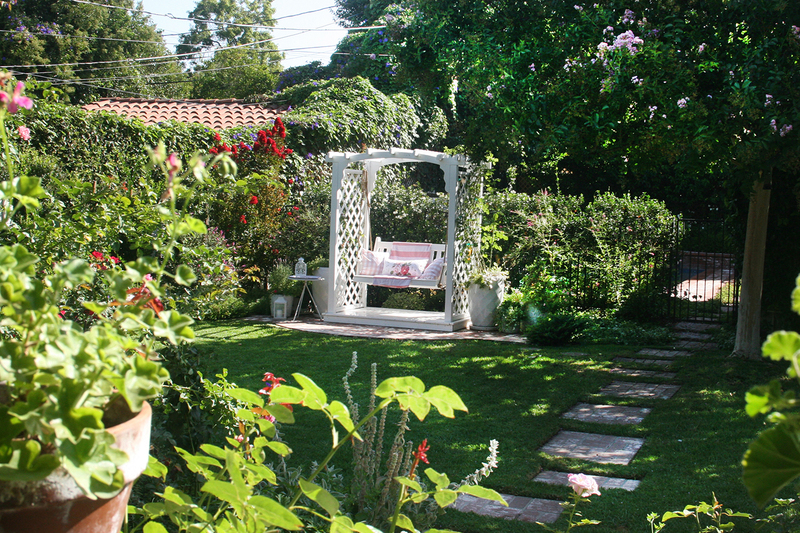 Photo courtesy of Toluca Lake Garden Club. One of Allyn’s goals has been to foster community outreach. An opportunity to help the next generation of gardeners arose when EnrichLA built a garden at Toluca Lake Elementary School in 2015, so the club contributed a bench and surrounding plants, and works to maintain the area for the students to enjoy. 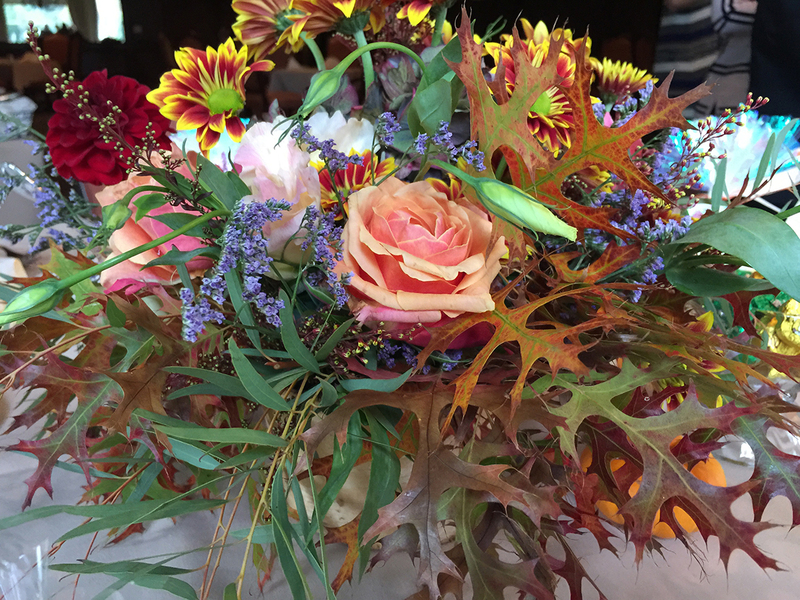 Members further reach out to community members by assembling a floral arrangement each month using plants from their gardens, which they deliver to a local business they want to show appreciation for or a resident who may be ill. The group also raises awareness at the annual Earth Day Festival and other neighborhood events, where members share their expertise on topics such as planting flowers and succulent gardening. 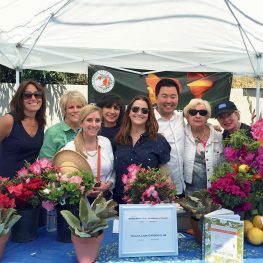 City Councilmember David Ryu stopped by the Garden Club’s display at the 2017 Earth Day Festival and Taste of Toluca. 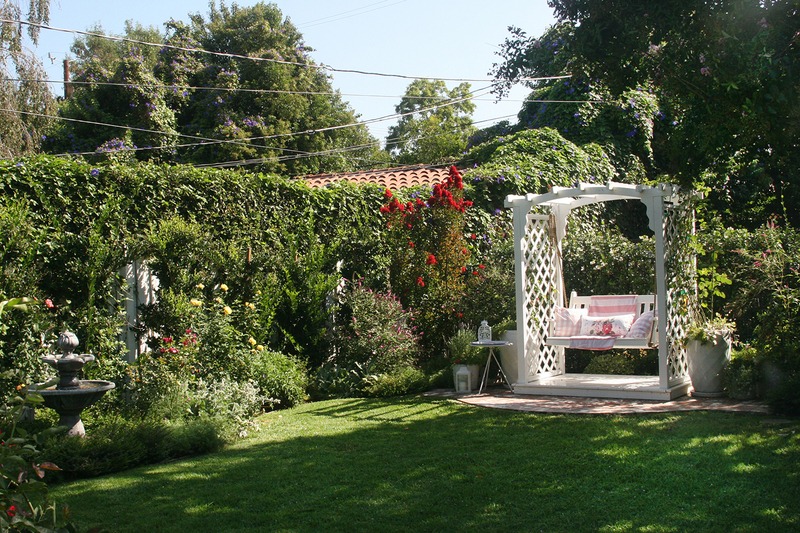 Photo courtesy of Toluca Lake Garden Club. 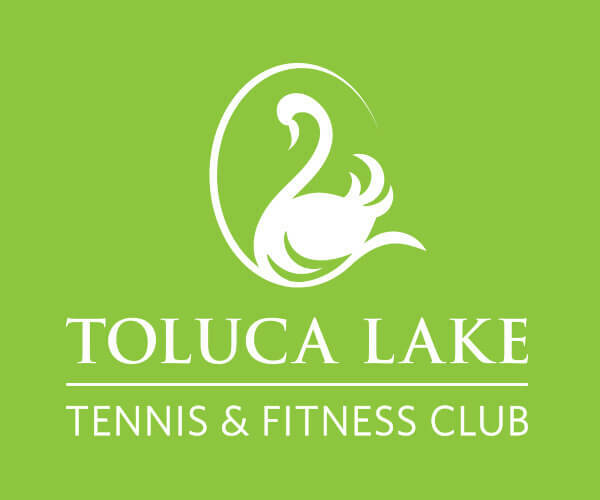 With all these activities, it may come as a surprise that the Garden Club has fewer than 35 members; bylaws restrict membership to residents of Toluca Lake proper, although several who live on the outskirts have been grandfathered in. 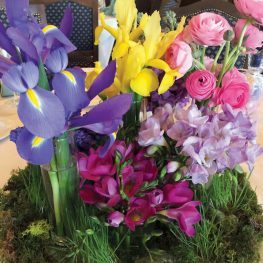 “Unlike other garden clubs in the district, which have larger memberships living throughout the greater metropolitan area, our club is made up of local residents who see each other walking on the street or run into each other at Trader Joe’s,” notes Allyn. “It’s a close-knit group of people who love to work together to beautify their city.” The result is a high level of engagement in the club, and a consistent commitment to attending meetings and participating in events. Though unified by geography and dedication, the members are diverse in background and interests. “We all appreciate gardening, but not all of us are true gardeners,” as Allyn puts it. 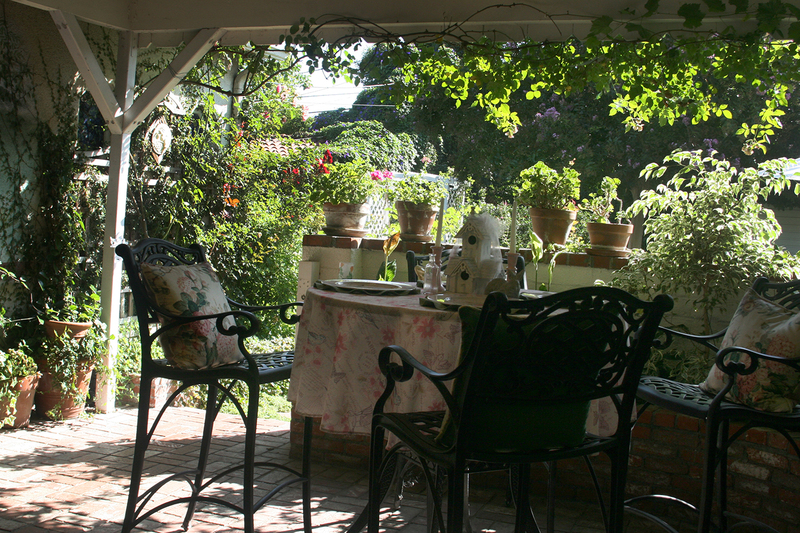 Although there are members who garden every day, having one’s own garden isn’t a prerequisite. Some members have large pieces of land to work with while others have a few plants in pots; some focus on flowers while others grow fruits and vegetables; some prefer formal gardens while others favor drought-tolerant and native plants. 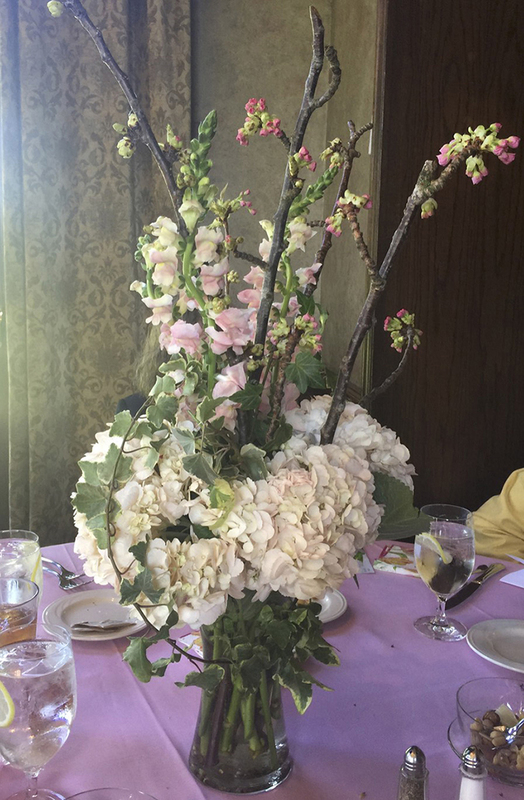 Check out the slideshow below for scenes from Garden Club member Shelley Zbornak’s verdant backyard garden, floral arrangements created by members, and images from the club’s history.